I am considering producing a grand masterpiece in O scale. How about the Northern Pacific's 90 ft. Brick Round House based on the First Class Standard Plan of 1910. Now that would be quite a model. Hold out your hands 22-1/2 inches wide and imagine that! All the cool brickwork, wood timber frame, roofing, clerestory, engine doors. Don't forget the inspection pits and floors! No promises yet, but if you want one let me know so I can gauge its popularity. I'd really like to do this model. Some have complained that I've promised things and never do them. I try not to promise what I cannot deliver. I had hoped to have this model and several others in production by now, however, I did not know I was going to buy and operate another structure kit company, Builders In Scale. 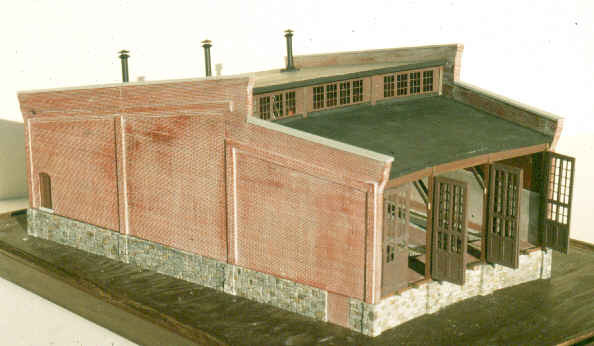 Creating such a kit in O scale is a major undertaking. It will take time, and yes, lots of it. Please be patient with me. You'll also want to check out the details of my HO scale kit . My plan is to produce about one O scale limited run kit per year. I've already got about a dozen ideas. I wonder what I'll come up with? It should be fun. The Wolf Creek Saloon sure was, but I doubt that I will do too many full interior "deluxe" kits. It's just too much work. Next, I think we will just try a regular building, perhaps a generic commercial building. Oh, and check out the scratch-building stocks.